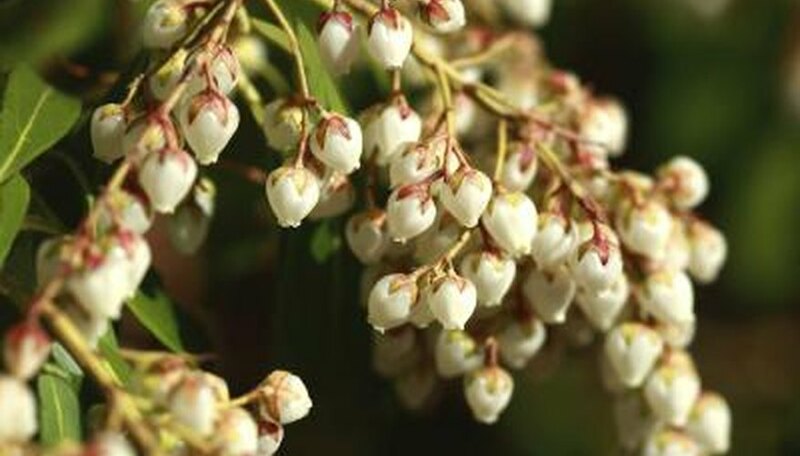 The colorful leaves and dramatic masses of bell-shaped flowers on andromeda shrubs (Pieris japonica) need less care than you might think. The shrubs will thrive with minimal attention in U.S. Department of Agriculture plant hardiness zones 5 through 8 in a moist, lightly shaded bed. A little routine maintenance goes long way toward preserving their good looks and long-term health. One of the most important aspects of caring for andromeda shrubs is soil moisture. They grow best in cool, moist soil and do not tolerate drought well. Established andromeda shrubs require at least 1 inch of water weekly during the summer, with additional water during times of extreme heat or drought, or if the shrub is grown in full sun with no afternoon shade. Too much water is also problematic because constantly soggy soil creates a welcoming environment for bacterial and fungal diseases. Spread a 2-inch layer of mildly acidic organic mulch beneath the drip line of the shrub to keep the soil moist, cool and weed-free, and water only when the soil feels mostly dry in the top 1 inch. Andromeda shrubs are light feeders and seldom require supplemental nutrients if grown in organically rich soil. The soil may lose nutrients over time and require a slight boost to bolster the shrub's health and appearance. A 1- to 2-inch-thick layer of compost containing well-rotted manure will provide all the necessary nutrients for healthy growth and it will help keep the soil in the ideal pH range, between 5.0 and 7.0. Leave a 2-inch gap between the compost layer and the shrub's trunk and replace the mulch layer each year in spring as the buds begin to swell. The tidy, rounded growth habit and dense foliage of andromeda shrubs needs little grooming. They may need occasional pruning to remove damaged, dead or unwieldy growth. The best time to prune andromeda shrubs is in spring after they finish blooming. Up to one-fourth of the shrub's live growth can be removed, but doing so may permanently alter its naturally attractive growth habit. Snip off any unwanted interior branches at their base to open up the crown, which will improve air circulation. Branches can also be removed from the trunk to create a treelike form. Before pruning, soak your tools in a solution of equal parts rubbing alcohol and water for five minutes to kill any pathogens, then rinse off the solution and wipe them dry. Wear gloves when pruning andromedas and wash your hands well after touching the plants because the leaves and flower nectar are highly toxic and may cause severe illness and death if eaten. Healthy, established andromeda shrubs rarely suffer from serious pest or disease issues. Most diseases, nutrient deficiencies and insect infestations take hold when the plant has not been cared for. Healthy shrubs can experience a cosmetically damaging infestation of andromeda lace bugs. The most common symptom is black or brown spots and yellow patches on the leaves. Treat infestations in early spring with insecticidal soap. Combine 2 1/2 to 5 tablespoons of insecticidal soap with 1 gallon of water and put it in a garden sprayer. Apply the solution liberally to the undersides of the leaves on a cool, windless morning every seven to 10 days until the problem subsides. Insecticidal soap is safe to use, but it is best to wear goggles and a face mask to prevent contact with your mucous membranes.